THIS IS VINTAGE NOW Vintage music compilation--Jump Blues, Vocal Jazz, Bachelor Pad Music, 1950's, 1960's, and 1940's style music. THIS IS VINTAGE NOW is a Vintage Music compilation series that features great artists who bring the spirit of the 1940's, 1950's, and 1960's to today! 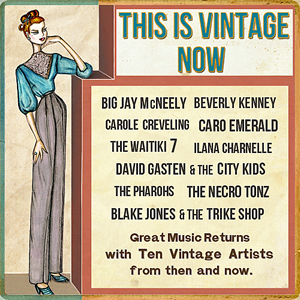 Featuring Beverly Kenney, Big Jay McNeely, Caro Emerald, and more, the magical excitement that we want from new music is back, thanks to This is Vintage Now and its artists! ThisisVintageNow.com is an information website built as a companion to This is Vintage Now and to The Vintage Movement in general. You will meet and hear the artists of This is Vintage Now Vol. 1 in our About the Artists section. We have introductory articles and annotated discographies covering Louis Prima, Bill Haley, Louis Jordan, and more in the Our Heroes section. And our Vintage Links section is a resource page with more to explore in Vintage Fashion, Vintage Lifestyle, Tiki Culture, and, of course, Vintage Music. Think of ThisisVintageNow.com as a doorway into a whole new world, and a better world at that: the exciting and deeply satisfying new world of VINTAGE.